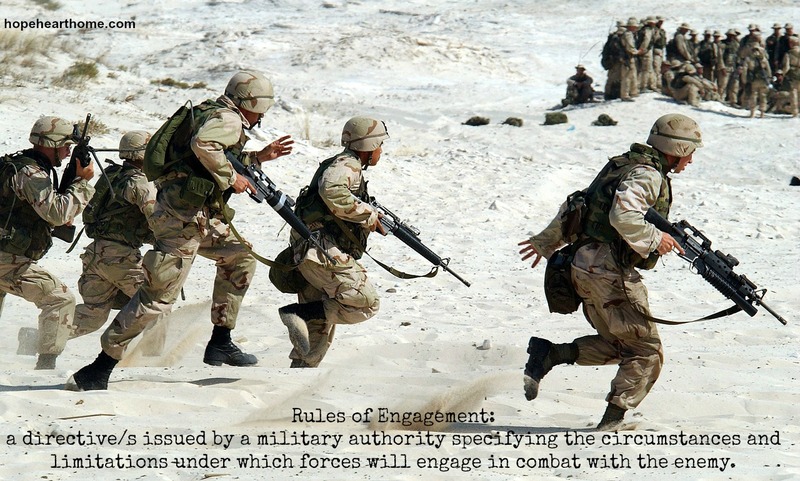 Rules of Engagement: a directive/s issued by a military authority specifying the circumstances and limitations under which forces will engage in combat with the enemy. I want to apply this to the spiritual battle all born-anew, followers of Christ engage in on a daily basis. Let’s answer several FAQ’s! Why is this battle raging? 2. Truthfully? When we die and go to heaven! No more curse! 3. The Word. The Word. The Word. After Jesus’ baptism and before He began His earthly ministry, He went into the mountainous desert places surrounding the city and there He was tempted by the devil for forty days. His defense? He quoted scripture. You can read exactly what Jesus said to Satan here. 4. Here’s where we can get excited because our God has armed us well! Every morning after we brush our teeth and comb our hair we get dressed, right? The best-dressed believer adds these items every day to their outfit! I heard a Bible teacher share an incredibly interesting fact about the Roman soldiers of Jesus’ day. And, you will note this in movies pertaining to biblical times. In emergency situations, the on-duty Roman soldiers could be spotted by their tunics and their belts. When on-duty their tunics were shortened by the cinched belt, enabling them to move quickly without being tripped up by the hems of their skirts. When they were off-duty their belts were loose and their tunics hung long and (almost) dragging the ground, disabling them from responding quickly. Now, how much sense does that make that Paul would refer to Truth as the belt? When we have the Truth, and know The Truth, and it is secured in us, we are ready for anything the enemy wants to throw at us. What a phenomenal word picture that creates. God is always about the details! What about us? Is our Belt of Truth in its correct position? At the ready? Or, is it sloppy and disengaged? Amen! We truly are armed and dangerous to the enemy… I love that verse in 1Peter because it says the devil roams around seeking whom he MAY devour… so I just remind him that he may NOT devour me – I am covered and he has no access to me! Great reminder! We are armed and dangerous! He is always on time! Great Post! A reminder and encouragement for me. Thanks for sharing! Tayrina, I love having new visitors! Thanks. While sitting in a waiting room this morning, I came across an article in the Baptist Mature magazine. The title, Jehovah-Nissi, was written by a woman whose ministry is prayer. She writes about Moses’ staff and that it represented the banner that he and others were in God’s army hense the banner is GOD. A brief but helpful article. Everything He does, has done, or will do, is for His people. His banner over us is LOVE and care. Glory to His Name. I’ve been a mess the past few days – really truly – this isn’t want I thought a forty day fast would be like. I imagined strength, but all I feel is brokenness. Just yesterday I was thinking about Jesus’ 40 day fast in the wilderness and how weak and exhausted He was as well. And now here you are today, telling me what to do. I need to combat all the attacks with Scripture – Just like Jesus did. Thank you for writing this for me, Susan. I hope that I am always ready to combat the enemy with Jesus’ words. I have been thinking a lot to do about how we use our words. My 7th grade Confirmation class is a great class, but so often I don’t think they realize how hurtful their words can be to each other. I am going to remind them tonight that they have a choice and that they need to use God’s Word for the good. The world will be a much better place if we can remember that God has given us the armor for battle against the enemy. Oh Tara – WORDS are so crucial – I do hope you get this across to them in a graceful, gentle way. We have to keep our belts secure and be ready for battle! i love this post! I never knew that about the Roman soldiers. That makes that scripture so much more relatable. Thank you for sharing that knowledge! 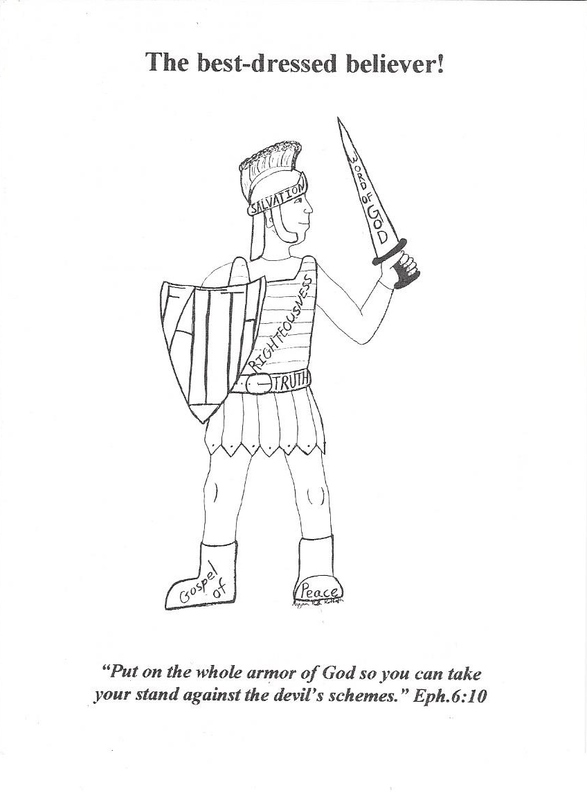 I was just discussing the importance of the armor of God with a student over coffee just the other day! I am so intrigued to find out about how the belt worked with the Roman guard’s clothing. Such great insight, thanks for sharing! Laura – learning that put a whole new understanding of the armor for me!